A woman who has hallucinated about being a witch assaulted a nurse while in a drink and drug-fuelled state, a court heard on Wednesday. Kerry Holland’s barrister said she suffers from a delusional disorder and has no memory of her aggressive outburst in a Belfast hospital. Holland, with an address at Verner Street in the city, was convicted of disorderly behaviour, assault on police and common assault on the female nurse. 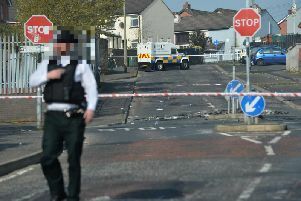 Belfast Magistrates’ Court heard she had been acting erratically and refused to cooperate with officers during an incident at Victoria Street on July 30. A prosecution lawyer said she was loud, aggressive and continued to swear amid attempts to calm her down. A PSNI constable feared he was about to be assaulted due to her behaviour. Holland was arrested but then taken to an undisclosed hospital due to her level of intoxication. The common assault occurred while the nurse was carrying out triage. Holland had to be woken in the public gallery so that she could enter the dock for the hearing. District Judge Fiona Bagnall was told she does not remember the incident or even being in hospital. Declan Quinn, defending, set out his client’s history of alcoholism and substance misuse. “She started on heroin when she was aged 15,” he said. Mr Quinn cited expert medical opinion to back his submissions that her mental health issues were not due to drug-taking. “There are significant underlying issues,” the barrister stressed. Holland also thought voices from the television were referencing her, the court heard. Agreeing to the suggested deferral of sentencing, Mrs Bagnall acknowledged Holland seemed to be getting the services she requires. The judge ordered her to return to court in nine months’ time.